"'Thank you!' Say it often today. Thank God for 'being born on 3rd base' and let Him expand your heart of gratitude and generosity this week"
After having had a frustrating afternoon where I had almost been bit (3 times), my hair pulled, and being spit on, I was reminded of why I am here. Why I teach. Why I step foot into my classroom each day. I was reminded that I did not need to just be grateful for a job, but truly grateful for the opportunity to teach my young student, even in this moment. I got the privilege, just as I do each and every day, to teach my student compassion and forgiveness. I may not always recognize these feelings, but truly I am blessed to be teaching a great group of little guys! So to my fellow educators, I highly suggest something that can remind you the reason you do what you do. Day can get busy and cluttered with small and minuscule details. Frustrations come as often as the sun's rays, but focusing on those negative thoughts are not where our minds need to be. For me it is staying focused on God, for others it may be just a reminder of the higher goal is. Either way, as teachers we must find ways to encourage ourselves. The following are some ideas to give yourself a start! A daily text from a friend or a family member to help encourage you. Or even an SMS text from an automated site. It's amazing how even the automated stuff can sometimes hit us just right! You could set your phone to remind you at least one time a day to be grateful. Use the calendar, a fancy app, or even a sticky note posted to your computer screen. You could even start a group of people at your school to help encourage one another! Like this one! Find encouraging quotes, like the ones here, to write down and put in your lesson plan book, around your desk, in your car, wherever you will see it! Work on memorizing a quote or a Bible verse to help you keep calm, stay focused and be grateful for the opportunity you have been given to teach GREAT minds! Some great quotes can be found just by doing a simple Google search. Here are a couple links for that - Encouraging Quotes for Teachers, Encouraging Quotes, or even Desktop Quotes. Whatever it is you choose, I speak from experience, it helps in times of stress and frustration. I hope this list helps you! If you have a suggestion to add, please feel free to comment! If you are not an educator, but if you now one, never be afraid to say you are praying for a teacher. Send a word to encourage them during the day, by email , text or even a note! If you are a parent, it helps to send a thank you note to your child's teacher. If you dont know a teacher, say a quick prayer every time you see a crossing gaurd or pass a school. Every little bit of encouragement helps! PS. Thanks to those who sent those GREAT message of encouragement to my phone this week! You have no idea the impact. You know who you are! Today I am linking up with Camille and her cute sisters at Six Sisters Stuff. This is exciting! I like linky parties! it seems to have made me feel more welcome to the blogging world! 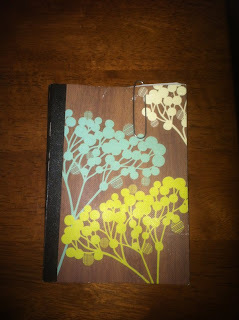 Still trying to figure out how i could have one and what i might have others link up with me and my blog! Gonna have to get creative! 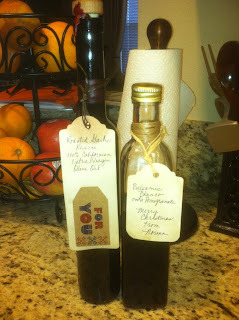 So today I am sharing a homemade Christmas gift from my husband's Aunt Norma and her son (my husband's cousin). Normally people share baked goods and/or candy. This year i decided to go against the grain and i made Cinnamon Almonds that i put in recycled jars. (This was a lot of work to get the labels of and to cut fabric to make the jars adorable!) But, my in-laws seems to have a great solution to the amount of work i put into my spiced nuts. That and they never had to say that they were giving away their nuts! Tee hee! 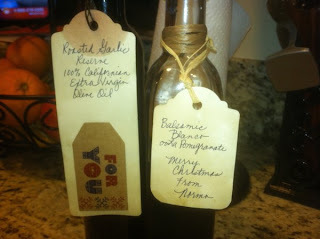 So, this year Aunt Norma made Balsamic Blanco Vinegar La Pomegranate and Roasted Garlic Reserve EVOO. These mixed together have made a great salad dressing! Literally all we have done is mixed the two to drizzle over our salads during the week and it has been tasty and light! This seems like it turned out great. The bottles are perfect and cute enough to decorate the counter top. I even like the rick-rack she decided to use to tie on labels. Here's a how to link if you wanna make the vinegar. Might be a bit of work, but at the same time would be good to make in a large batch and then store for use at a later date! 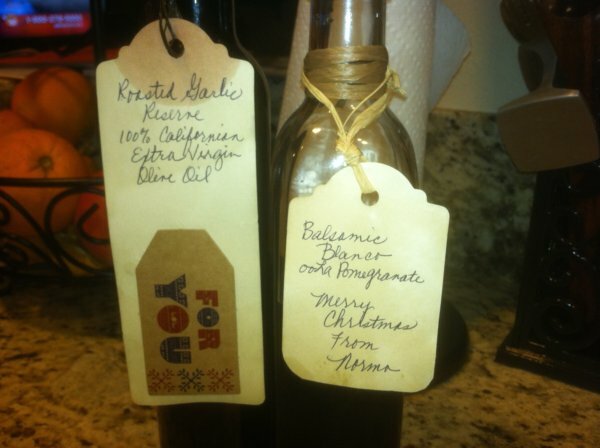 In addition to this, her son, my husband's cousin, Joe started us off with a great bottle of vanilla extract. 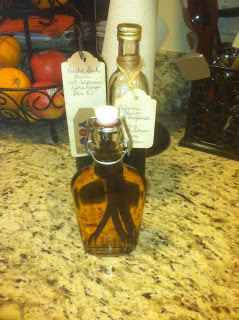 He merely took vodka and vanilla beans in a cool looking bottle that when aged for three months or so, we would have a great big bottle of extract. This too has looked great on our counter! I know these items made great gifts for the holidays, but i thought they would also make great gifts to warm the house, a hostess gift, or even just because! These seemed to me to be great gifts for the cook or baker as well! So there's my idea! (Though i know it was stolen!) Let me know what you think or even if you decide to try this endeavor! I would love ot hear from you! Comments welcome! How is it Friday and I feel way more stressed than I should!?!?!?! I guess this is nothing that a little shopping with a girlfriend and a whole hour of kickboxing can't cure tomorrow! Any who - Sorry there was no post yesterday and this one is gonna be a quick one! We are late for homemade pizza made by my Mom!!! So here's a quick review of the Snickers Popcorn that I made ... it was good to taste, but took way too long to make! 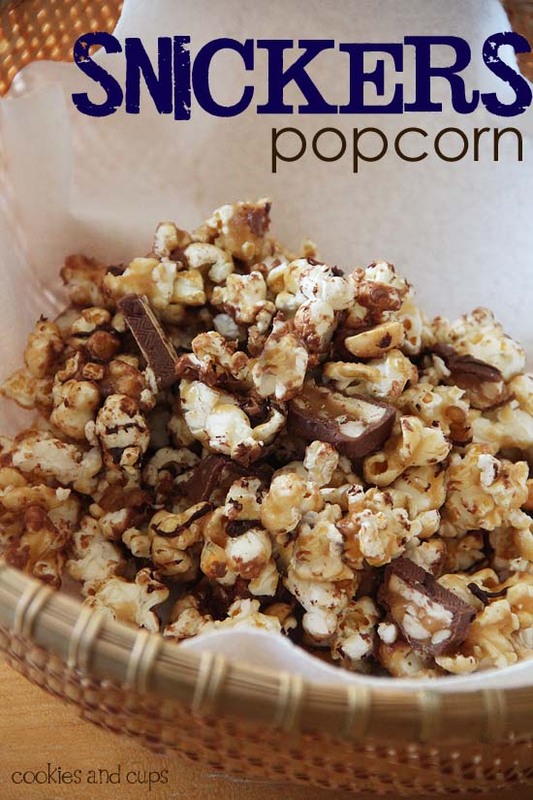 Also, while I am at it I purchased the Nordic Ware Microwave Popcorn Popper in order to make the popcorn for the Snickers Popcorn recipe.... and let me just tell you.... this thing is pretty cool! Air popped popcorn is really as simple as pouring in 1/3 of a cup of kernels and then hitting a few buttons on the microwave! So awesome. That would be my best purchase this week! (This might change tomorrow when i go shoe shopping!) Mine is yellow, but it certainly doesn't matter what color it is... LOVE IT! I can't wait to buy fun seasonings to try out! Any who.... off to go eat pizza! What's brought me joy this week? Well, this has been a tough question for me this week. It has been a struggle to feel on top of things and I am really trying to keep a positive attitude. Stress and Simone are not a good mix. The worst part is I am not sure why I am so stressed. I guess I really am feeling like i just want time off, even though I love teaching my little guys! But, this post is not to complain or gain any sort of pity. Just merely stating it was more difficult this week to come up with something! I guess what has brought me joy is definitely being able to cook for others. Since I have gotten married, it has become a great joy to meal plan and see something finished. So many times, as someone who has dabbled in so many crafts, cooking has turned into a sort of hobby that has brought me joy just in completing that task. There are so many unfinished projects that I wish i had enough hours in the day to complete! This week the menu items have turned out quite nicely. It brings me so much joy to know that I pulled off a recipe successfully. I know it sounds really cheesy, but it really does make me feel like a wife who has fulfilled a duty. I sometimes have those domestic tendencies. 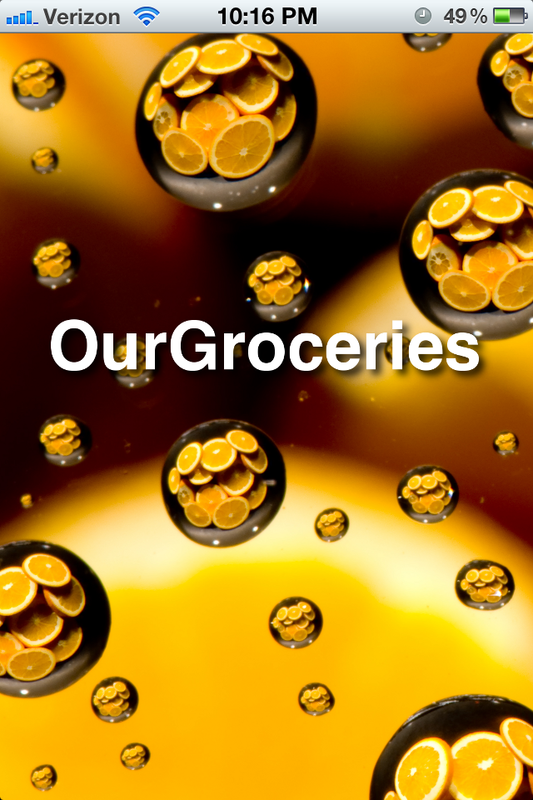 I also feel that I have filled my belly and my husband's belly with yummy and healthy food! I will post a review of my experience tomorrow! Oh and here's the GOLDEN SPATULA!!! Hey there! Hope every one's Tuesday went well. My kiddos actually did pretty well today! Surprise, surprise! For Teacher Tip Tuesday, I thought I would share how us special ed teacher modify. Now we all know that special ed kiddies are not only in my classroom, but many are in regular old public schools surviving! That would be because they have teachers who know how to modify or accommodate to the learners needs. So, with this comes knowing how to group students and it also depends on what subject. I will get into grouping in a later post, but at this point I am digressing! So, here's one of the games that I made for my little ones to practice nouns, verbs, pronouns, and adjectives. 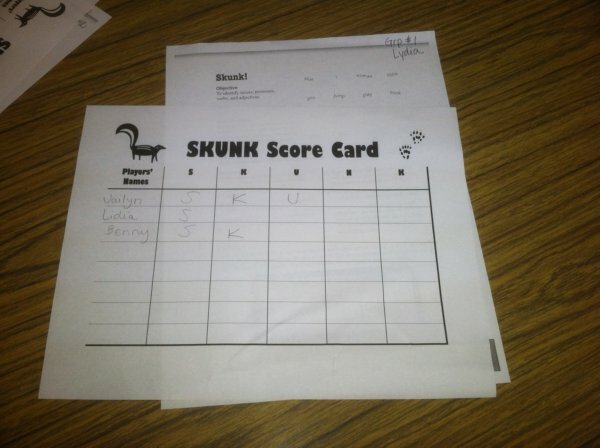 It's called SKUNK! It is basically played similarly to HORSE (the basketball game) but instead you are trying to match all the same type of word as students pass one card at a time in a certain direction. The picture below shows the score card and an example of some of the cards. So, one way that this is modified is the color coding of all the words. Nouns are in black, verbs are in green (think plants GROW=GREEN), adjectives are orange and I forget what color I made the pronouns. Basically, I use the standard color coding that is used in GLAD (Guided Language Acquisition Design). If you don't know what Project GLAD is you can find out more about it here. I LOVE teaching with Project GLAD and thank my lucky stars that I got to be *officially* trained in GLAD strategies this last summer! Any who, all that to say that the words were all color coded the same as what is used in Project GLAD! With this game I made three groups. The highest group had all words (adjectives, nouns, verbs and pronouns). The middle group that tends to have lower reading skills had the same types of words but the words were a little easier to decode. 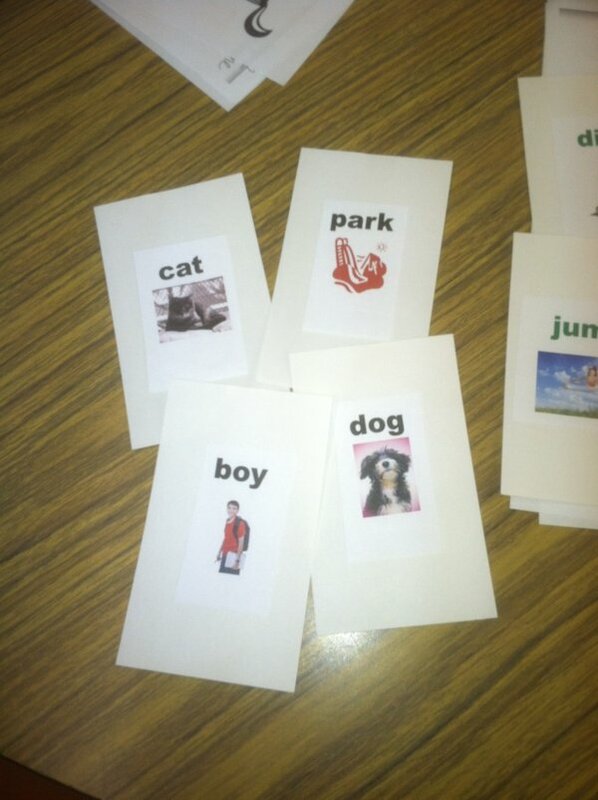 Then my lower group (these little guys have very limited reading skills) had pictures and words and no pronouns. These cards can be seen below. 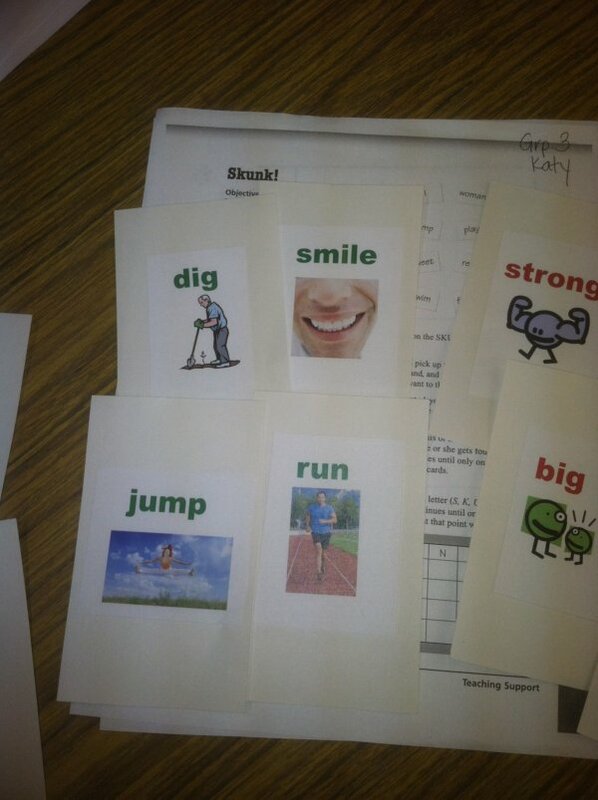 Each group got a set of cards, instructions and a score sheet that i made based on the chart on the directions page. Now, I must admit the game was fun for the highest group, the middle group struggled but had fun anyway, and the younger group ended up reviewing what a verb and a noun was. This was a learning experience for their teacher! Thank goodness for my aides who do a great job at modifying when needed! 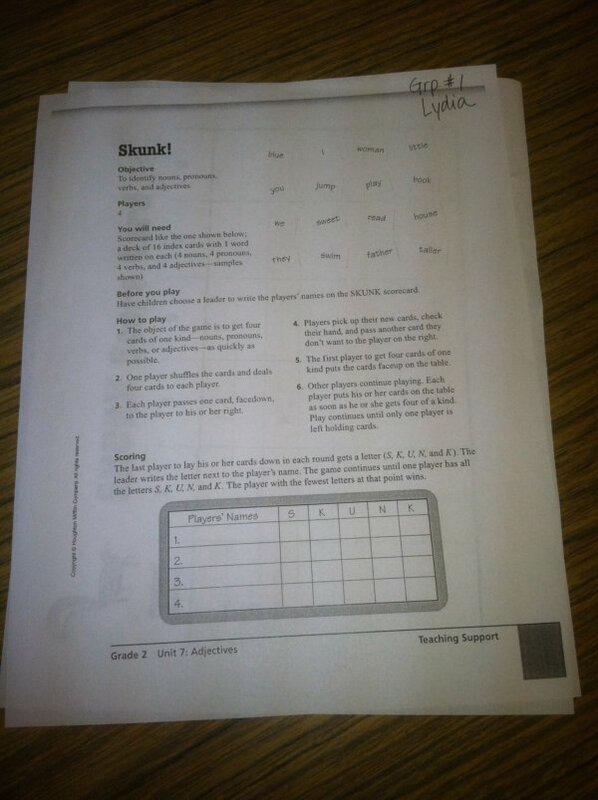 However this is an example of how a language arts game can be modified to work on the same standard for different leveled students. 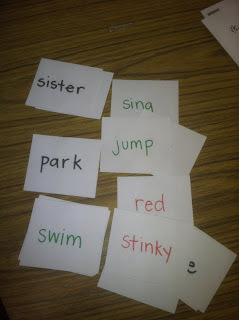 It also really showed me where my kids were at with identifying adjectives verbs, nouns and pronouns. So with that, I'm ready to go back to the drawing board and find better leveled games for my younger kiddos! Hope your Tuesday finishes off GREAT! Today I am sharing about my weight log. For years now, I have logged my weight. I weigh myself every morning completely naked after having used the restroom. (I will spare the details of a trip to the restroom!) Now i know that not everyone monitors their weight so closely, but this could be done on a weekly basis, or even a monthly basis. 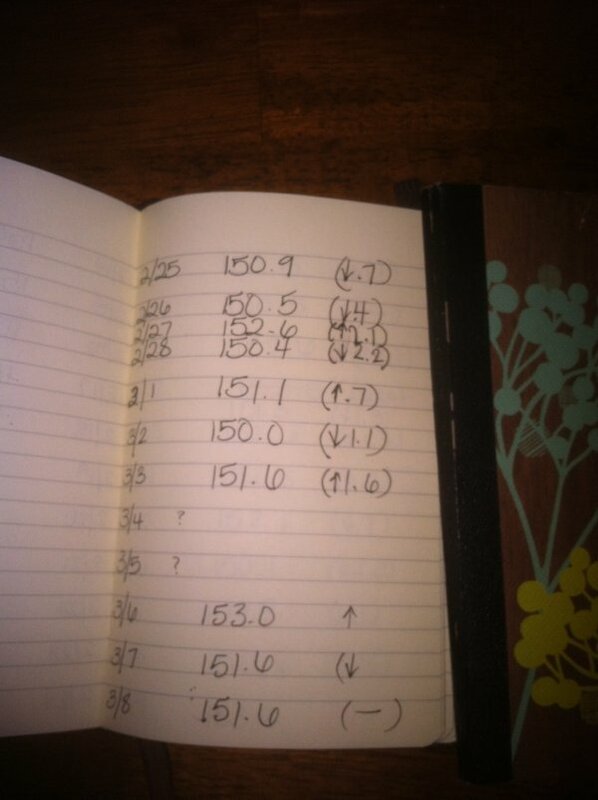 Either way, I log my weight every morning with the exception of a few mornings like when my hubby and I go on a trip! The next step is to determine what you want to log. 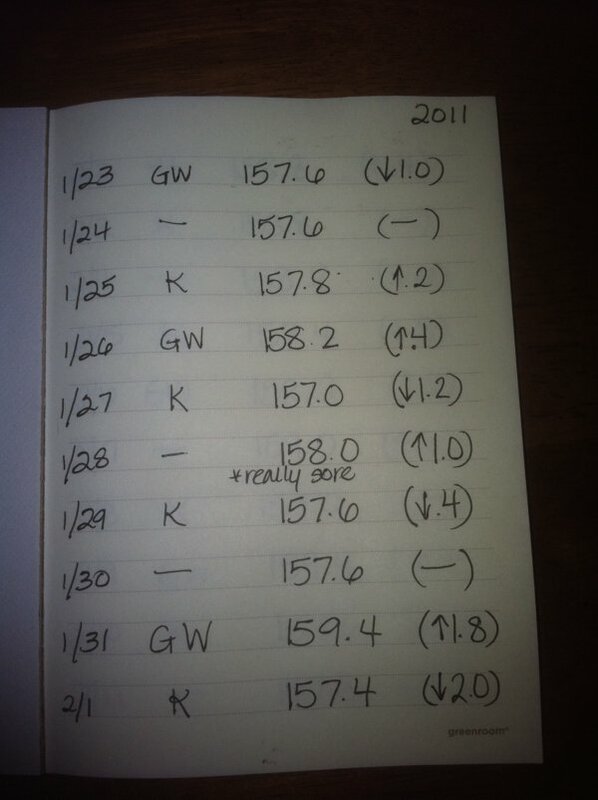 In my case I log the date, my actual weight, and how much I went up (UGH!) or down (:D!) from the day before or the last weigh in. 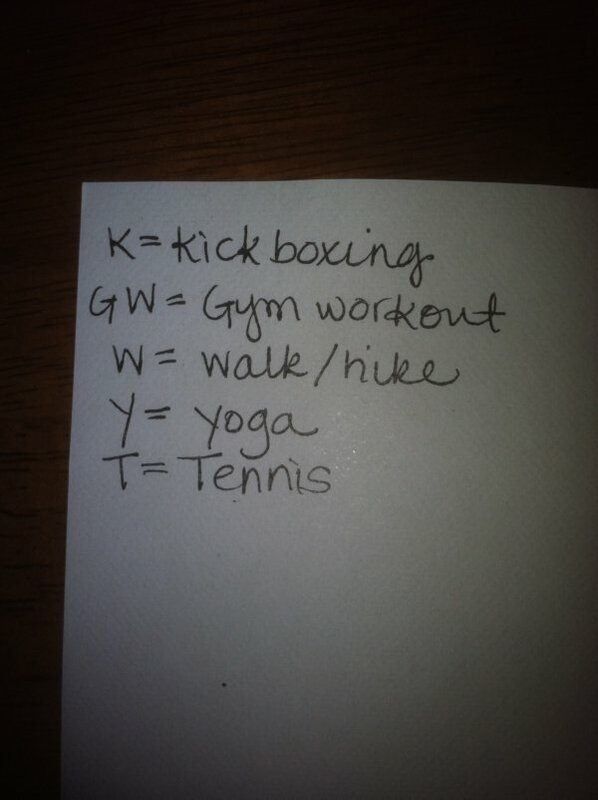 I have also started to log my exercise. This can be seen in the pictures below. The inside cover of my log has a little key for any of the different exercises that I do. This can quickly show me how many times I have worked out in a week and it really takes no time at all. You might also notice that I have noted when I am "really sore" because I know that that means I am probably retaining water. This can also be reflected on the scale and so, I do other stuff to help with water retention. (I will post about this at a later date!) Anyway, here's one last shot to show you when I forget to log it looks really inconsistent. This pic is from my log from a couple years ago. Sometimes I would just remember what I had weighed that morning and then fill it in later, I have learned my lesson. I don't like those little question marks , so I now religiously write down my weight right after my weight in. I have even moved my log to the bathroom (it used to be in the bed room) to help me do it immediately. This entry also shows that I haven't always logged my exercise! So, that is my weight log. Many people know that I am "perpetually on a diet," but really I just want to be healthy. These logs have really helped me to see the changes in my body (as far as weight is concerned) over the years. It has also become a bit of a scrapbook of sorts. I can tell you when my last vacation was and any day I was sore or injured or even sick! I also log when i have allergies and other sorts of troubles (I said I would spare the details of the restroom didn't I?). I must note too that these logs are from at least a year (or more) ago. Life has changed and I am currently trying to get my weight down to these numbers again. On my wedding day I weighed 147 and that would be awesome! PS. With all this football and basketball on the screen.... is anyone beginning to miss baseball? I am so looking forward to seeing the Angels play this season!!!! Just sharing a quote tonight... this made me think this week. I wonder if I would want to meet myself?!? 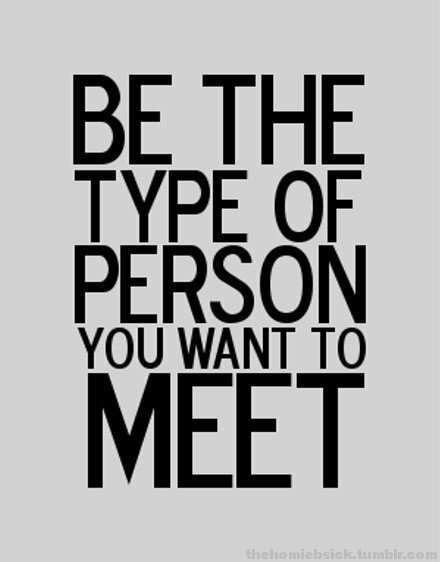 There are times where I think I wouldn't want to meet myself and other times where I would really like to get to know me. Tonight is my first LINKY PARTY!!! I have decided to share a day in my shoes with you all! So get ready for the whirlwind that was Wednesday, Jan. 18th, 2012! 'Cause here we go!!!! Thanks to Miss Klohn for hosting a linky party! Great idea for your first one! 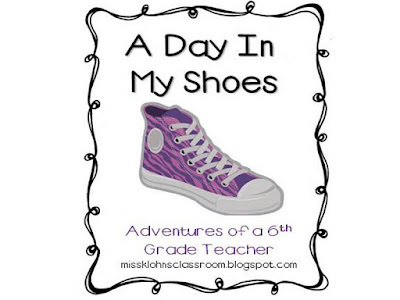 Visit Adventures of a 6th Grade Teacher to read other teacher's daily experiences! 5 am Alarm goes off and I head to begin my day. I begin by doing general bathroom stuff - hair, make-up, brushing my teeth, etc. all while listening to NPR with my iPad propped up next to me. I often am trying to wake my husband by shouting to him from the bathroom and that was definitely the case yesterday! 5:35 Yes it takes me 35 minutes to get myself all put together. I do have to straighten my hair, and just as a side note, I wash my hair on Tuesday nights so, straightening my hair on Wednesday morning takes a little longer! Anyway, at this point I head to the bedroom, change, pick out clothes by standing in the closet for approx 5 minutes. I usually lay out my clothes on my sleeping husband and then get dressed. (His side of the bed happens to be near the closet.) Yesterday though, my husband is up with me which makes it so much more pleasant! I enjoy having someone else to get ready with. 5:47 I head to the kitchen and pack my prepared lunch into my min-cooler, make a couple bottles of tea, and then make sure i have a snack, fork and extra tea packets all packed away. Also, I wrap up my breakfast sandwich in a paper towel and thank my husband for making it for me! I also thank him for making me a chai latte! Yum! 6:00 I check the outside temperature on our wall thermometer and see 40 degrees! Yuck! I grab a coat and figure out all the layers that will be suitable for the morning chill! 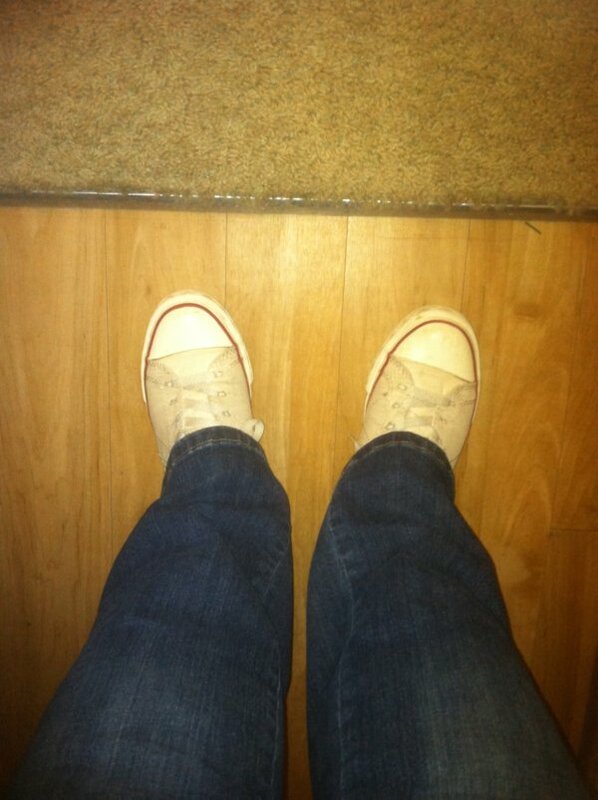 I then sit down for a minute to wait for my husband and put on my shoes! Here they are below! 6:15 My husband and I walk down to our garage from our apartment with our lunches in tow. When we leave at the same time i drive him over to his truck that he has to park a short distance away. I give him a big smooch and say good bye. I then wait for him to start his work truck and we both head off to work. Can you believe he works approx 45-50 miles away, but the drive takes him about hte same amount of time as my 15-20 mile away commute? Darn all those stop lights. 6:26 I turn up the country music and eat my breakfast sandwich with my chai tea near by in the cup holder! 6:49 I arrive at work and head to my classroom unlocking one gate and my classroom door. I thn set everything down and turn on the heater! Brr it was a chilly morning! I then spend the next hour in my classroom prepping and planning. I set work out, make a quick run to the copier and then set out warm up packets that the kids will work on independently while we wait for everyone to arrive! 7:57 My neighbor and I grab our warm drinks and walkie talkies (our campus uses these to communicate because we have no phone system!) and walk to our morning meeting where we hear about what student are absent, new intakes, IEPs scheduled for the day and any other necessary info! 8:05 I check my box really quick while another teacher watches my one student who has arrived. He eats breakfast while I rush to the office and back. 8:15 A few more kids have arrived at our assigned classroom table and a few students are eating breakfast. It happens to be one of my students birthdays and he arrives with chocolaty Spider-man cupcakes ready for his celebration. He quickly asks if he can have one for breakfast!!!! My answer was most definitely NO! 8:25 Students are told to finish up and I begin having student line up to head to PE. The PE teacher was out so my AWESOME aides run PE while I get a few more minutes of prep time! 8:35 I am back in my classroom alone and I try to get my desk cleared so that i can at least see my lesson plan book! I then set out a math game for a group of my students and then straighten up a little around the room! 9:20 Math begins late this morning but oh well! Gotta roll with the punches sometimes! I played a winter math game with 4 students and they loved it! I am trying to get them to remember basic math facts with sums to 10 and boy is this taking some time!!! 9:45 Math is over and snack and recess begin. Today is a student's birthday so, we sing to him and he eats his cupcake while he hears all the wonderful compliments his teachers and fellow classmates share with him. (They cannot get a cupcake unless they share a compliment as a "gift" to the friend.) A quick bathroom trip for some of the kiddos and the birthday boy then decides to throw a whining fit just because he has to use the restroom. Ugh! 10:15 Reading time begins and I have one of the student lead us in the pledge of allegiance. Every one sits down and i send the kids to their various tables to work with either me or one of my aides. This week and next week i get to work with the little ones who are working on letter recognition and phonemic awareness. This is a tough group to work with. They have low attention spans and it can just get maddening. It really is like trying to contain a set of ants. Just when you get one where you want it, the other 2 have walked away! 11 am Time for lunch! Yesterday the kids struggled with walking in line. I really feel like a drill sergeant because I am constantly telling students to walk nicely, stop kicking rocks, and or be careful of any hazard we may come across. I am also constantly saying "don't run" and "walk to catch up" while my aides echo the same things! We stop at the restroom to wash hands and offer a bathroom break to those who need it and then head to the tables to eat. I eat my salad while i walk around the table and try to chew with my mouth closed! 11:25 We line up and have a quick recess time on the playground outside our classroom. 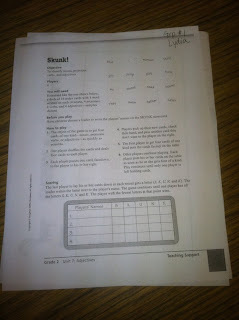 11:35 WE head back into class and we begin to take our spelling practice tests for the week. Usually we do this on Monday, but this week it happened on a Wednesday. We would have done it Tuesday but we had group with our AWESOME therapist! 12:05 Time for a sentence patterning chart. Yesterday we filled in our noun and listed out adjectives. I spent a bunch of time repeating what each one was and this is all while some students are struggling to even remain in their seats. You must understand that my special ed kiddos get the MAJOR wiggles towards the end of the day. Their behaviors also seem to explode or begin to explode by this time of the day. So I begin to brace myself and try to be as animated as possible to hold their attention! 12:30 We line up for computers. I have one student who needs to stay back so he can line up without touching other people or their belongings. Lining up and transitions can take a bit of time. My new kiddo gets out of line and ties his shoe, I ask him to stay at the end of the line and before i know it he is upset and trying to close the gate with students in the way. My aide and I immediately direct him to take a time out and he then latches onto the fence post! Here we go - off to the timeout room. This is one of the toughest parts of my job! 12:37 My aide and I arrive at computers and the computer teacher excuses us all to have our weekly team meeting to discuss classroom issues. We talk about how everything is working. The whole group is there - the behavior specialist, therapist and my two aides. We sit and tell stories and concerns about our little ones. Our heads are spinning already because it has been a rough day. This can be a relaxing and informative time for us all. 12: 50 The computer teacher informs us that one of our little ones has to use the restroom. I take him really quick and then send him back to the class. I rejoin the meeting! 1 pm I stop and talk to my academic program supervisor and tell her some stuff... and then rush, literally run, back to my classroom. 1:40 All done! Time for free time! The kids can now play if they have earned it. We have tons of toys that they all love to pull out and play with! I begin to complete make up work with some of the students who have missed periods due to their behaviors. 2:05 Time for chores. The kids are usually pretty motivated to do this. My aides finish up calculating their daily scores and then I share announcements. Yea, that's right announcements are at the end of my day. I feel it is more effective in getting it through to them in a quick way. I remind them of their homework and that all can go rollerskating this Friday. Then we begin lining up. Ugh! I dread the walk at the end of the day to our dismissal spot! 2;20 We walk over and say good bye to my aides (they drive routes in the mornings and afternoons - a GREAT benefit to our kids!) I then try to remind the kids that they could earn a sticker for good line behavior. I miraculously manage to get all 10 students to the table without anyone getting hurt!! Whew! 2:25 We arrive at our table and birthday boy is complaining that he didn't get to take his cupcakes home. (This is all because he whined and whined and whined instead of following our directions to get ready to go home!) I know I seem a bit mean here, but he is 8 and sounded MUCH MUCH younger - a consequence was MORE than needed! For the record, I did not eat even one! I pass out point sheets and stickers for good line behavior and off to their vans they go! 2:40 Three students wait for their van with me. We sit and look through my sticker book. This was a fun time. My littlest one is excited to see all the car stickers. 2:45 All kids are gone and I head to the front office to check my box and write up and incident report on the student who went to the time out room earlier in the day. This takes what seems like forever! The reports have to be super detailed. 3:10 I head back to my classroom and begin to plan my next Social Studies unit. I do a little research on the computer, download some GLAD Units to use and then take a page or two of notes. 5 pm I leave my room and shout good-bye to my neighbor who is packing up. I think i got all my stuff but i get to my car and realize I left my lunch box! Ugh! Back I go! Then back to the car and off I go! 5:34 I arrive at home, set my stuff down and then get a call from my supervisor, we talk while i straighten the living room and attempt to do the dishes. My husband turns on the vacuum during this and it makes it tough to talk. We say good-bye and I finish up the dishes. 5:55 I begin to bake a batch of cookies for the snack for our life group! Oatmeal is what I have in the closet and I didn't even get creative with it - no raisins or chocolate even! 6:45 Sit down to the computer and write a quick blog post. Then play around on the computer. 7:25 Our life group co-leaders arrive! Woo hoo! So excited to have them join us! Other members arrive and we proceed to hang out and chat just so our co-leaders can get to know everyone! 9:45 Life group members leave and our co-leaders stick around for some planning details to be ironed out. We finish up and by 10 pm the apartment is quiet. 10:05 I hug my husband and then head to the shower. The warm water felt so good! 10:35 All dried off and in jammies! I grab vitamins and an allergy pill and plop myself on the couch! I read a couple blogs and then my husband turns on Modern Family. I love that show! The episode is the one where Lily cusses! Too hilarious! 11:15 Modern Family ends and hubby and I head to bed. We pray together and I fall asleep by 11:25. That is one crazy day. I am sure there are many things I have left out, but that is an example of a day in my shoes! I hope you enjoyed! I know my school is not extremely common, but it is a good program and I will be sharing more about it in future posts! PS. I know I complained about birthday boy a lot. He has just been a handful since Wednesday and we think it is only because of his birthday! That has to be irritating! I do enjoy having him around though. He has such a child-like spirit when he's not whining! He also has a great sense of humor! What's bringing me joy today? 2 things .... its so hard to limit myself now that i have been doing this every week. I am now finding myself looking for the things that truly are bringing me joy each week! 2. The second thing that has brought me joy this week is MY CLEAN APARTMENT!!!! I am loving how it looks so much better and is way less cluttered. I have to say my husband has really kicked it into high gear and has said enough is enough for both of us. So we cleaned and stuffed Christmas stuff into storage bins on Saturday. We also straightened up our garage! It is also really cool that we finally got a brand new vacuum all our own! (We had been using difficult-to-use "hand me down" or borrowed vacuums before now!) 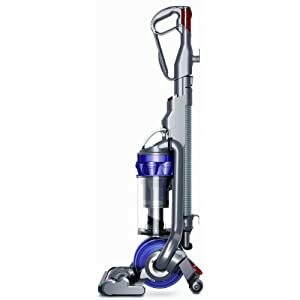 It makes vacuuming so much easier! I love my new Dyson! So that is that....tomorrow I will be participating in my first "Linky Party" and you will get to hear about "A Day in my Shoes"! Can't wait! So here's an item I have made extremely reusable and usable for my students. While my kiddos have number lines and ABCs on their name plates that are on their desks, when we are at our tables doing work as a group they don't have access to what's on their desks. So, I bought a roll of ABC stickers and a roll of number lines at my favorite teacher supply store (CM School Supply). The rolls of these stickers come with quite a few but all you need is 3-5 or each one. The point of these is to use them during work at the tables, games, practicing counting, ABC order, distinguishing between b, d, p, and q, and anytime the kids can't remember certain letter formation! The ABC strips also really come in handy during spelling tests! Step 1: Stick the stickers on to construction paper and make sure you leave enough space between the stickers to be able to have an edge once they are laminated. Step 2: Laminate the entire poster and cut out individual strips for individual use. Step 3: Place these in a handy place to pull out whenever needed. These can be used at home as well. Students often struggle with homework and need some of the same supports they are offered in the classroom to be able to complete their work. Students tend to be very visual and these little tools can help them complete homework independently! Keep in mind - it helps to teach the little ones how to use these! 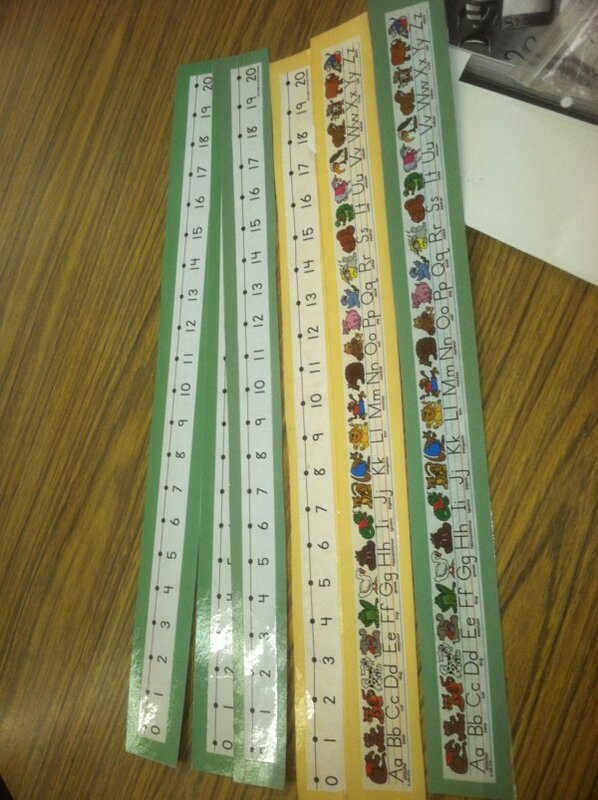 There are many strategies to help the kiddos figure out how to do their addition and subtraction using these strips. However, ABC strips really are pretty straight forward in their use. Hope everyone had a great Tuesday back at work! As my aide says: "Happy Tuesday!" Hey there! Hope everyone who has the day off is truly enjoying their day off in remembrance of a GREAT man! I wonder what our lives would be like without Martin Luther King Jr.
Any who, I have spent the morning grocery shopping and getting the oil changed on my car. The shopping was in preparation for the meal planning I have done for the week. What's on the menu this week? For lunch we will be having the Candied Pecan, Apple, and Gorgonzola Salad from The Girl Who Ate Everything. I love that blog and have found some great treats and healthy options because of her great blog! For our dinners I have altered a recipe that I found on Skinnytaste. (I felt I wanted some more veggies and also, a few more spices!!!) Here's my version of a crock pot veggie turkey chili. Brown turkey, onion, and chopped bell peppers in a medium skillet over medium high heat until cooked through. Drain any fat remaining and transfer to crock pot . Add the beans, chilies, chickpeas, diced tomatoes, tomato sauce, cumin, cayenne, and chili powder mixing well. Cook on high 6-8 hours. Garnish with onions, cilantro and cheese and enjoy! 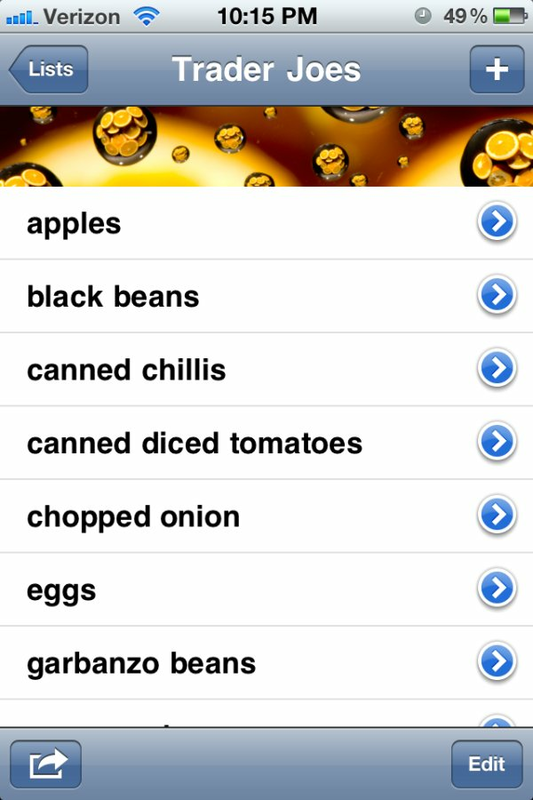 Here's the app that I use on my iPhone to take my grocery list with me. This prevents me from forgetting my list at home and also prevents me from forgetting items. 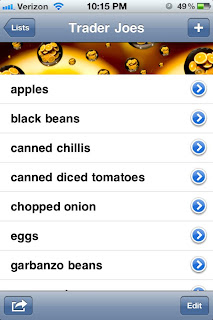 So as you can see, I have items on there ready to buy for my chili and as I added each item to my cart, all I had to do was touch the item and it disappears from the list. I do this every week and I think people look at me like I am texting and shopping, but it really does work for me. This app can be found for Android and Blackberry phones! What would we do without our smart phones? I hope my hint might work for you!